The Toyota Tacoma continues to be the best selling mid-size pickup year after year. These trucks offer smooth on road comfort and plenty of capability off the beaten path. BDS Suspension has now test fit and confirmed fitment of all current Tacoma suspension systems up through the 2015 models. With 2″, 4″, 6″, and 6″ performance coilover systems currently available, BDS offers a variety of suspension options for late model Tacoma trucks engineered to the highest standard to improve off-road performance while maintaining on-highway drivability and allowing fitment of up to 35″ tires. All BDS lift kits are backed by Factory Protection Plus offering a No Fine Print Lifetime Warranty and a 5-year 60,000-mile drivetrain warranty at no additional cost. Get the most out of your Toyota Tacoma with BDS Suspension. For more information on the kit see below, head online to the BDS Suspension website or call us at (517) 279-2135. 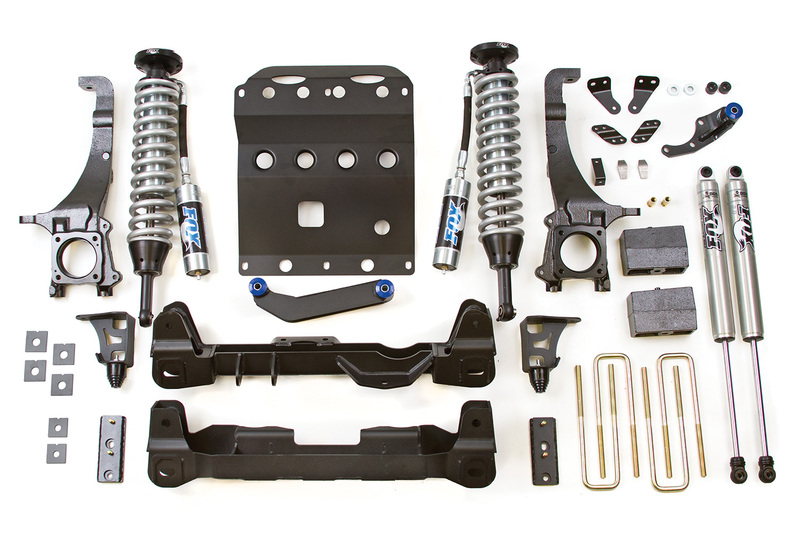 4″ IFS Lift Kits: Stepping up to 4″ lifts, BDS offers 4″ complete IFS system including everything necessary to modify the suspension and drivetrain with room for 33″ tires. 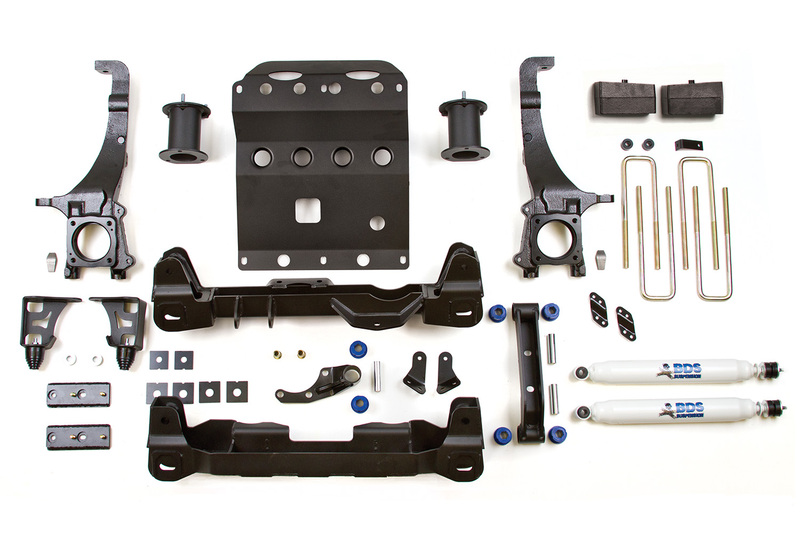 The kit includes a pair of laser cut 1/4″ steel crossmembers along with precision machined ductile cast iron steering knuckles to maintain stock-like handling characteristics and compatibile with the factory ESC system. Also included is a full width belly skid plate, top mounted strut spacer to retain ride quality, differential drop brackets to correct CV and driveshaft operating angles, brake line relocation, bump stops, rear blocks, u-bolts and your choice of BDS 5500-series hydraulic or Fox 2.0 performance gas shocks specially tuned for this application. 6″ IFS Lift Kits: At the heart of this 6″ lift kit is a pair of ductile iron replacement steering knuckles and high-clearance crossmembers. 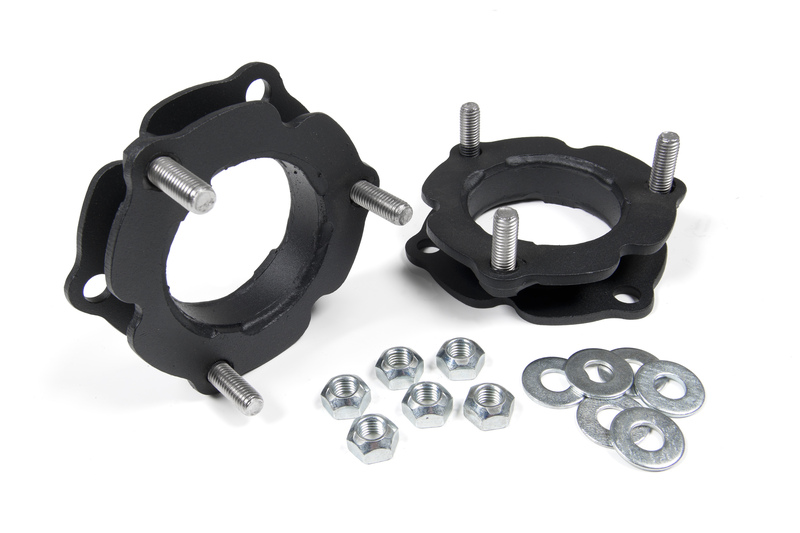 These components establish a suspension geometry that not only performs well on and off-road, but are compliant with the factory traction control systems. A multipoint differential relocation kit securely repositions the front differential to correct CV axle angle while allowing for the use of the stock front driveshaft. 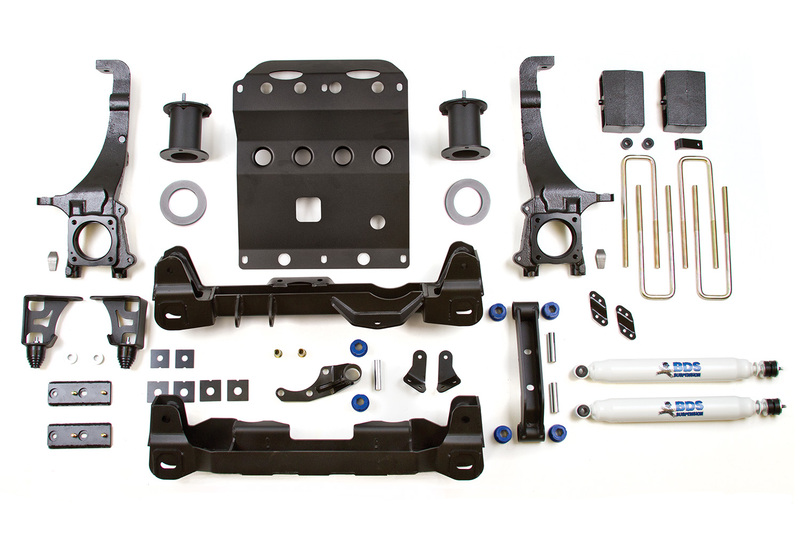 Front end drivetrain components are protected by the full width skid plate that ties the front and rear crossmembers together for a rigid subframe. Top mounted strut spacers are used along with preload spacers to improve handling performance. 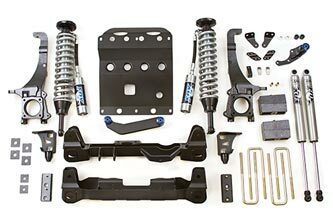 Also included in this kit are replacement bump stops, brake line brackets, 4″ rear block kit to level the stance and your choice of BDS-5500 series hydraulic or Fox 2.0 performance gas shocks specifically tuned to enhance the ride quality and performance. This system allows for up to 35″ tires to be installed. Easy bolt-on installation, coil spring preload set for proper ride height right out of the box. Right height adjustable using BDS spanner tool #129600 (sold separately). what particular components are different because I’m getting a little itchy and want to lift my truck asap..I heard that the difference was just some of the bolt sizes in the lower control arms. Is that correct? Is there any target date for the revised kit to be available? There are a few minor changes to the suspension on the 2005-2015 vs 2016 Tacoma. Our engineering team is working on the updated kit and it will be available soon. Once available we’ll be posting up a new product announcement, social media posts, etc. Bought it and installed it.drove with it today for the first time.r tire hits inner fender when turning.Is this normal? That would depend on the wheel/tire setup you went with, we list our recommended wheel/tire specs on our website. Due to the tight fender shape it is common to need to do some fender/valance trimming on the Tacomas and potentially trimming the body mount at the backside of the front fenders. I’ve very interested in your 4 inch kit, however, I would very much like to use coilovers. To your knowledge are there any “other” companies out there that I could incorporate “their” coilover into your 4 inch kit? Thanks. I have a 2014 Tacoma and I’m wanting to squat the back end a little bit. Do ya’ll carry a kit to squat the truck or can i buy separate front and rear suspension lifts? Ben, is the truck lifted? If so how much? We don’t offer a lower kit for the Tacoma, but assuming its running a lift kit you could use a smaller block kit in the rear to get a desired tail low stance you’re after. Same story here I want a 6 inch lift for my Tacoma .I see Pro comp has one on 4 wheel parts website they are using part number EXPK5073B but it says 05-16 Tacoma so I am not sure yet. Are you close not the route I want to go, but whoever gets it first has my money..
Hey Brody, while they are similar, there are some changes from the 2005-2015 to the 2016 Tacoma, mainly involving the lower A-arms that require some changes on our kits to offer up a 2016 version. Hang in there we’ll have kits available soon. Any word on when the 6 inch coil over lift kit will be available for the 2016 toyota tacoma? Thinking of buying one soon and want to lift it if did, thank you. Yes. Please. Need. 2016. 6″C/O kit. ASAP. Any update fir the 2016? Also will a 5100 bilstein for a 2015 fit the 2015? 2016 Tacoma TRD Off-road waiting for the new lift. Any news on the release date yet? We’re expecting the 2016 Tacoma kits to be available very soon, our engineers have been working on making the updates from the 2005-2015 kits to offer a 2016 version. Company policy dictates we don’t discuss kit info, release date, pricing, etc until parts are on the shelf and we’re ready to ship. Any word on the 2016, 6 inch coilover? I’m dying waiting. I’ve had the 4K saved since last year. Can I get on a waiting list? r the 2016 4in suspension BDS available yet. I have a ’09 Tacoma, with a 6″ Rough Country suspension lift kit. Will the 6″ coil over still work to replace the rough country? Hey Nicolas, the FOX 2.5 coilovers are designed to to provide 6″ of lift and should bolt right in place of your current top mounted strut spacer setup. #883-02-048 is the part number for the pre-tuned 6″ FOX 2.5 coilovers with remote reservoir. Does BDS make anything bigger than 6″ lift for 2017 Tacoma. Hey Cody, 6″ is the tallest lift option we offer for the Tacoma trucks. I’m having trouble deciding whether to put a 4” or 6” lift on my 2010 Tacoma, what is the lift size in your product video? Hey Charles, the white Tacoma at the top of this announcement as well as the silver and red Tacomas from the video are fitted with 6″ lifts on 35″ tires. As far as deciding between the 4″ and 6″ lifts, that really just comes down to what size tire you want to fit. Both kits are based off the same core components (crossmembers, knuckles, diff relocation, skid plate) so if you decide to change right height later on you’ll only need to swap the strut spacer and rear blocks to do so. The 6″ is definitely our more popular seller to all fitment of 34-35″ tires, the 4″ kit will fit 33″ tires. I have a 2014 Tacoma (xsp-x) double cab with a leveling kit. I have been hunting around for a 6” lift. The only problem is that my truck is two wheel drive. Do you guys offer a 6” lift for this? If so I would love to purchase one. Hey William, thanks for your interest in BDS Suspension. While we designed the kits around the 4WD Tacoma, they will fit the 2WD Tacoma as well. One thing worth mentioning is on the 2WD applications its common to length the rear driveshaft slightly when installing a 6″ lift, any driveline shop will be able to take care of this.